The Viggen is an iconic legacy plane from the height of the Cold War, when Sweden had to be resistant to plausible “eastern” threats. The shape of the Viggen is what really puts this plane apart from all other modern jets from that time. It comes to a huge single-engine plane with an unmatched double-delta wing, a one-of-a-kind nozzle that permits the plane to stop at very short runways or even to land on normal roadways. 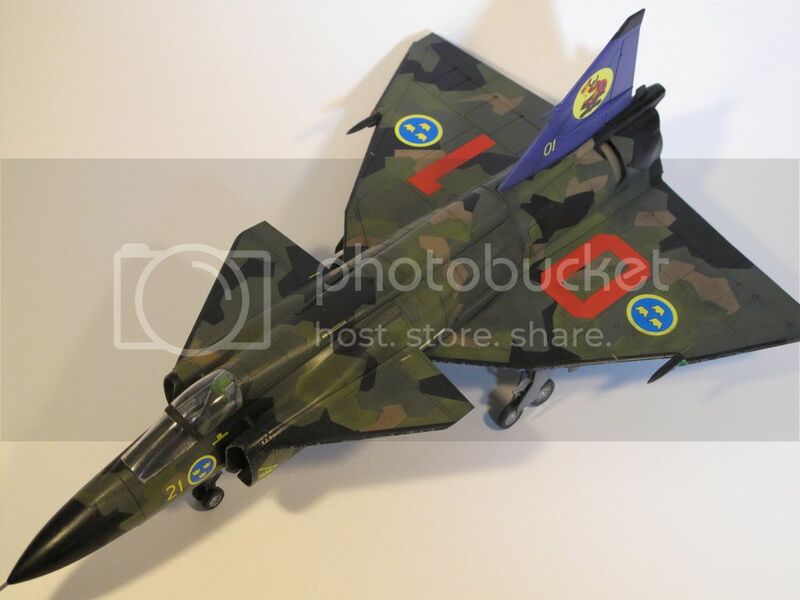 Then, the camouflage – there is nothing like the Viggen in its 4-tone greenish camo with the huge red numbers and that`s exactly what Tarangus provides with this 1/48 scale kit. Instruction manual: A rather small B&W manual with very simple and easy to understand visualizations of the assembly process. At first glance, one could think that the manual concerns only the gluing steps, but that`s because the general information, the recommended paints, as well as all other important information is listed on the first page only. There are numerous grey plastic sprues, each with its small and not so small parts. The lower wing is one whole piece, offering impeccable alignment of the wing to the fuselage. The cockpit is packed with details, but the instrument panels look like for a kit in 1/72 scale, i.e. the details are very stylized, simple and they are not sharp. It is a nice, large and glossy sheet that permits 4 different airframes from 3 different types – with the splinter camo, with the two-tone greyish camo, and with the bare metal finish. The large colorful pictures are enough to orientate how exactly to paint the model and where exactly to put the decals. The Viggen has only a few dozens of decals. This will make it possible to accomplish the attachment of the decals in just about a couple of hours. The decals themselves look beautiful in colors, contrast, arrangement, brightness and thickness. While opening the rather small box, it gives a sense of a rather mediocre kit, but there is almost no free space in it. This is a wonderful 1/48 scale kit of the Viggen and the numerous details make it not so easy for assembling. However, it has only plastic parts and the small clever instructions will help you get through the process quickly and easily. The transparent parts for the canopy have no lines from the molds in the middle, so no extra cares required. The surface details on the plastic parts are neither awesome, nor sparse. They are just enough for an OOB kit in the middle range in terms of quality. This means that if you want to get the maximum of this kit, you will need a good riveter and a couple of hours for scribing more panel lines. -	The packing of all the plastic parts in one big zip-lock bag is not enough for their protection – some parts are loose, others are cut apart from their sprues. -	No pilot figure. Of course it is not obligatory, but the Viggen on the boxart is depicted with a pilot in the cockpit. -	No payload included. A couple of underwing and under-fuselage pylons, a pod, and two external fuel tanks make a little exception. Highs: Easy 1/48 kit of the Viggen with very beautiful nozzle area. Lows: The surface details require several major improvements, such as thinning the trailing edges and adding more rivets. The instruction manual makes the assembly look easy and simple, but actually the kit contains dozens of tiny little parts. I built this kit and I really enjoyed building it. I am not sure I quite agree with the review. The detail is good and the fit excellent...I highly recommend it.